1982 | WHAT A FEELING! The French seem to love American police thrillers almost as much as Americans do, and they regularly make movies that imitate the hard-hitting American style. The gritty, roughhouse French thriller La Balance, however, does not really have to imitate an American style—because the writer-director is himself an American. He’s an expatriate named Bob Swaim, and his movie is lively, violent, and something of a mess. The first part of the film is seen mainly from the viewpoint of the cops—especially the police captain (Richard Berry) who wants to sting the city’s underworld kingpin (Maurice Ronet). To do that, he’s got to find some informers who will help set the crime czar up for a fall. He finds a prostitute (Nathalie Baye) and her pimp (Philippe Leotard) and bullies them into setting up the sting. Soon, our sympathies are with Baye and Leotard; the twist here is that the genuinely love each other, and are blackmailed into helping the police. There is still a tattered honor about these unlikely heroes, which is a far cry from the belligerent, amoral police. Even the jaded captain is impressed—and although he reneges on initial promises to the couple, he may be stating to like them. 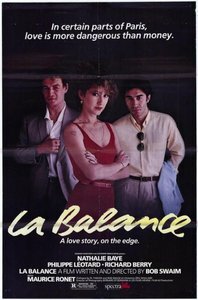 The world of La Balance is a world of betrayal, on various levels: in love, in crime, in business. Swaim conjures a convincingly ratty Paris underworld in which to set this tale of shifting loyalties, and the ugly cinematography adds to this. The film has a lot of ideas floating around, and most of them don’t quite come together. The air of confusion may be appropriate for the sense of moral ambiguity that Swaim clearly wants to communicate, but it makes a cop thriller considerably less streamlined. But the story works well enough, in large part thanks to an appealing cast: Baye is fine as the prostitute, and Berry does well in the tough part of the unshaven, world-weary detective. There’s probably no actor around who looks less like his name than Philippe Leotard; his boxer’s face gives him a streetwise authenticity, but he also carries an odd nobility. And La Balance itself has an authenticity, possibly due to the Gallic setting being filtered through an American mind, and seen afresh. Whatever the reason, it turns out to be a truly French French Connection. Swaim got a Hollywood stint out of this, doing the awkward Half Moon Street and the better Masquerade. This was a good period for Nathalie Baye, a delicate-looking actress with a distinct gravity. The Russian historical film Rasputin has been sitting on the Commissar of Cinema’s shelf for the better part of 10 years, having been, until recently, considered unfit for consumption. The ban probably stems from the film’s surprisingly tame view of Czar Nicholas II. According to the film, the czar is less the evil tyrant of Bolshevik tradition than a fretful wimp held captive by his wife’s obsession with Grigori Rasputin, the mad monk who eased the suffering of her hemophiliac son. During World War I and through his death in 1916, Rasputin held hypnotic sway over the royal family and indulged his own obsessions. In the film, he’s the evil one—swaggering, fornicating, threatening, and strangling live chickens—and the czar and czarina merely dupes. It’s a great story, filmed often before, with Conrad Veidt, Lionel Barrymore, and Christopher Lee among those essaying the meaty role. This Rasputin, potently played by Alexei Petrenko, is surely the most disgusting of all, with his limbs frequently jittering into freaky motion and his beard stringy with yesterday’s lunch. The palace life is a bit like Disneyland, complete with theme rooms (hot springs, walls painted to resemble a seascape), Rasputin’s harem (some of his women wear false beards to resemble him), and mannequins standing guard. In such an arena, Rasputin’s madness seems almost at home. Naturally, since Rasputin died one of the weirdest deaths of the 20th century, the film has a built-in big finish. In short order, Rasputin ate poisoned cakes and wine, was shot and beaten repeatedly, and finally was dumped into a river, where he took the hint and expired. Oddly enough, director Elem Klimov doesn’t play the death scene to the hilt; he even leaves out the river-dumping. His direction overall is lumpy and stuttering; the film doesn’t have much grace, but it’s vivid and entertaining in individual scenes. 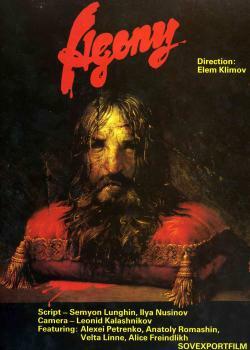 It may be unfair to judge Klimov’s overriding scheme, since the film has been cut by 40 minutes for export. A different kind of obsession is portrayed in Beyond Obsession, an Italian-made film from the director of the once-notorious The Night Porter, Liliana Cavani. An American oilman (Tom Berenger) becomes obsessed with a gorgeous Italian floozy (Eleonora Giorgi) in Morocco. She’ll have nothing to do with him, however, because she is obsessed with her father (Marcello Mastroianni), who is currently in jail for killing her mother. He, in turn, is obsessed with her. Pretty soon he becomes obsessed with Berenger for hanging around her. That’s a lot of obsession for one movie. Too much, probably. And a lot of business is none too clear at first—including the odd nature of the Giorgi-Mastroianni relationship, and her pupose in walking the streets at night. In another film, these mysteries might tantalize the viewer. In Beyond Obsession, they’re pretty irritating, especially given the obvious discomfort of the multilingual cast in just talking to each other. In particular, Berenger (the TV star in The Big Chill) clearly has no idea how to play his character. It’s the kind of performance that can take you beyond embarrassment. Klimov’s film, originally titled Agony, was withheld for a while, but apparently released around the time he did Come and See. The longer version of Rasputin is seeable, these days. Beyond Obsession is also known as Beyond the Door. There’s this passage in the dialogue of The Year of Living Dangerously that can be turned back on the film itself so ironically that few reviewers—including this one—will be able to resist quoting it. Radio correspondent Guy Hamilton (Mel Gibson) is taken to task by his photographer/travel guide/guru, Billy Kwan (Linda Hunt), about an overly melodramatic news report the green journalist has made concerning the terrible conditions in current (1965) Jarkarta, Indonesia, a place that is sinking into poverty as it teeters on the edge of civil war. Guy’s piece was overblown, says Billy; Guy hammered points home and repeated himself, instead of letting the facts speak for themselves. That happens to be an on-target assessment of the trouble with YOLD—things that would be better left for the viewer to discover on his own are carefully explained in the dialogue, and sometimes more than once. This practice is particularly discouraging with regard to the character of Billy, the mystically-inclined mulatto dwarf (and it’s especially frustrating because it mars a fascinating performance by Linda Hunt, a screen natural). Billy’s observations—noted in a kind of diary, on which we eavesdrop—get flakier and more pretentious as the movie goes along, spelling out plot points as well as character motivations. Maybe director Peter Weir thinks this relieves him of some of his story-telling duties; and perhaps that explains why this narrative is so uncompelling. Weir goes for atmosphere instead, and the story starts going astray—at its own languid pace. Even the love story, between Hamilton and gorgeous British Embassy attaché Jill Bryant (Sigourney Weaver) gets lost in the woozy ambience, although there’s a good sequence when Jill decides to give in to Guy’s suggestions of romance, and she walks down a street in the warm Jakarta rain; she’s soaked to the bone when she confronts Guy in the hallways outside his office, and it gives a special weirdness to the love scene that transpires. 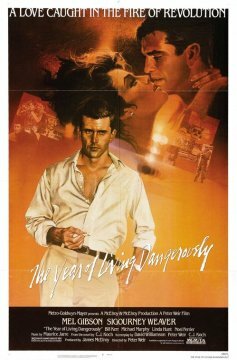 That kind of special weirdness has been a trademark of Peter Weir’s films in the past; The Year of Living Dangerously has a disappointing shortage of such strategies, which I guess has a lot to do with why it’s not my favorite Year. 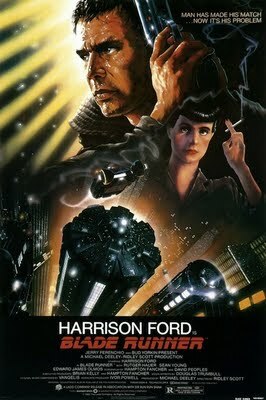 I did see this film again a few years ago, after reading the novel on which it’s based, and liked the movie very much. I think Weir’s ability to create his mysterious evocation of place and space was the deciding factor in my positive re-acquaintance with the film, although there’s a lot to be said for the human presence of Linda Hunt, and also Gibson-Weaver, a handsome duo. I still remember David Ansen writing in Newsweek (a writer I often felt in tune with back then) about the movie-movie gratification of the two stars finally getting into the clinches and laying some serious osculation on each other. He didn’t put it like that. In the first scene of An Officer and a Gentleman, Richard Gere is up to all of his mannered tricks: he twitches, he mumbles, he wearily stares off into space. The signals are discouraging; it’s not going to be another one of those performances, is it? Amazingly, about the time Gere gets his hair cropped—his character has entered military school, training to be an officer and a jet pilot—he seems to relax, probably because he starts playing against some pretty interesting people (namely David Keith, Debra Winger, and Louis Gossett, Jr.). I don’t know if director Taylor Hackford or Gere was aware of this softening and deepening of the actor’s style, but it turns out to be very appropriate to the character’s story: Gere plays a distant, private man who enlists in the officers’ training program as a way to hoist himself above an unhappy life; in the thirteen-week-long process of earning his wings, he discovers—as much to his surprise as anyone else’s—that he can allow himself to be a human being. This sounds like pretty basic stuff, and I guess it is, but a good deal of it is very entertaining. Gere’s duels with his hardboiled drill instructor are superb; there is the sense that he is battling against the dark demons in himself that tempt him to quite the grueling training and backslide into the rootless existence that came before. Louis Gossett’s fine, cunning performance as the D.I. has a lot to do with this, even if the movie occasionally skirts sentimentalizing his character. Off the base, Gere spends his time with a woman who has her sights set on becoming an officer’s wife. Debra Winger triumphs over the script’s condescension toward her character; she isn’t just slumming, and it rings true. This goes for David Keith, too, as Gere’s grinning Okie buddy; the tragic-best-friend bit can get pretty sticky if an actor doesn’t believe it, and Keith throws himself into it with his whole heart. We can believe that Winger and Keith are capable of thawing out the cool, isolated Gere. An Officer and a Gentleman is the kind of movie in which the unsuccessful sequences tend to be forgotten, while a few keenly realized scenes linger fondly in the mind. There’s a nice moment after Gere has had a first dinner with Winger’s family, and the couple reels out of the parental house, staggering from the amusingly frigid and uncomfortable reception they’ve had. As they are parting, Winger brings up the previously-hinted-at subject of marriage rather bluntly. Gere stiffens, by reflex; Winger senses his iciness, and her desperation rises to the surface. There’s an exact feel for a decision and an event not quite happening here—it will have to wait for a while, until Gere finishes his training and becomes an officer. And, importantly, a gentleman. An early review from the Seattle Film Society’s monthly newsletter. The movie was shot in Port Townsend, Washington, where locals still recall the colorful behavior of the participants (I got to do the onstage interview with Winger when she returned to Port Townsend for a film festival appearance , but I’m not sure AOAAG was her primary interest). The movie turned into a steamroller, with the ending and the song and all, but the review was written in relative innocence of that. Frightmare takes its story from two juicy bits of Hollywood lore. One involves horror great Bela Lugosi, who (it is rumored) started to lose touch with reality toward the end of his life, possibly because of his drug addiction, and may have drifted into his Dracula character while not in front of the cameras. He was buried in his Dracula cape. The other tale is a practical joke that director Raoul Walsh played on Errol Flynn, who was despondent after his friend John Barrymore’s death. Walsh, sick of Flynn’s whining, went down to the morgue, stole Barrymore’s body, sat the great actor’s corpse down in his living room, and invited Flynn over for a couple of drinks. Flynn became suitably freaked out when he arrived. In Frightmare, a famous vampire actor (Ferdinand Mayne) dies, is buried in his costume, but insists he will return from the grave. Then his mausoleum is broken into by some college kids who steal his body and proceed to party down with it. Then they put the body in the attic of the party house and go to sleep, whereupon the actor gets up and takes his revenge during the long night. Naturally, when the kids hear rustling upstairs, they get spooked. One girl says to her boyfriend, “I want you to look everywhere—even the attic.” Right. In the attic. In the dark. It’s that kind of movie. Frightmare wants to have a sense of humor, but it’s tepid, shapeless stuff. At the beginning, when we see the old actor shooting a commercial, he looks at the director and says, “It is you who are inept, not me.” Nuff said. The Dorm That Dripped Blood is a wonderful title, but when I went to see it, it had another title. The film bore the name Pranks, although this makes no sense—and then at the end of the film appears, in small letters, Death Dorm. 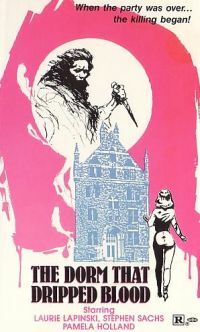 However, I prefer The Dorm That Dripped Blood, and since the film lives up to this title, we shall use it. Five people are hanging around an old dormitory, cleaning it out before it’s torn down. They look forward to hard work and good fun, but it is not to be. A maniac ruins everything by backing the car over one of them. Then someone comes in and messes up their dinner table, which really sends them into a tizzy. Then they hear something on the roof in the middle of the night, prompting the obligatory line, “Why don’t we split up and look around?” We know they’ll drop like flies after that. It’s a whodunit. The five people all think maniac is this creepy guy with frizzy hair who scavenges through the garbage, but Ol’ Frizz does a turnaround near the end, tries to help the heroine, and gets hacked up for his efforts. You can already sense that The Dorm That Dripped Blood is livelier than Frightmare. However, the acting is much worse, and it’s cheaper looking. I did like the last five minutes, though, in which an unexpectedly nihilistic conclusion is reached and it is suggested that somewhere, blood will continue to drip. Ripe for a sequel, it is. Look for it next semester. I’m sure I knew the Errol Flynn story thanks to The Men Who Made the Movies, Richard Schickel’s classic TV documentary series, which profiled Walsh is spectacularly salty fashion. The movie stars the tireless Ferdy Mayne and was directed by the imposingly named Norman Thaddeus Vane. IMDb.com says the movie was released in 1983 and Dormin 1982, but that’s how horror movies crawled around in those days. The Dorm That Dripped Blood came from the filmmaking team of Jeffrey Obrow and Stephen Carpenter, whose 1987 film The Kindred is—well, tune in tomorrow. Fred Zinnemann’s tastefulness has long been a bone of critical contention. He has collected lots of awards over the years from the establishment critics and the Academy of Motion Picture Arts and Sciences, but since the early Sixties he’s been living with the burden of being considered the most impersonal of the impersonal directors in (by now) most critical circles. My own limited experience with Zinnemann movies suggests to me that the latter group is probably close to the truth on Zinnemann; High Noon is, well, High Noon, but The Search, Oklahoma!, A Hatful of Rain, and A Man for All Seasons are pret-ty boring (not that this represents a definitive survey of his career). On the other hand, From Here to Eternity is one of my favorite movies, but it has always seemed to me that that film gets its personality from Montgomery Clift’s melancholy hardhead Robert E. Lee Prewitt as much as from its director. 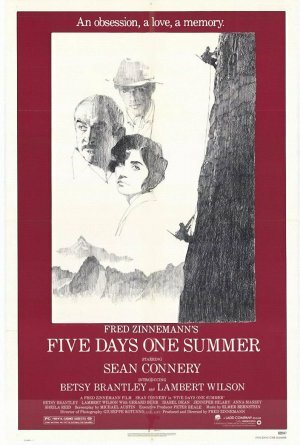 Anyway, Zinnemann’s newest film seemed to hold the promise of engaging him more than usual; Five Days One Summer is set in the time of his youth, around and on the mountains that held fascination for the Austrian-born Zinnemann (not that literally autobiographical qualities have anything to do with how personal a film is, but it was a promising sign). The movie’s about a doctor/mountaineer (Sean Connery) who escorts his much-younger lover (Betsy Brantley) to a resort in the mountains of Switzerland. Their troubles: he is a married man, she is his niece, the Swiss mountain-climbing guide disapproves—and also happens to dig the girl very much. There is not much story there, and Zinnemann doesn’t flesh things out or dig too deeply. He does give the story a strange subplot: in the course of hiking, the trio discovers the body of a man who disappeared forty years earlier—on the night before his wedding. His bride-to-be, never married, is confronted with the corpse, kept mint-condition by the snowpack; she, of course, is an old woman by now (this scene takes place beside a river that is the result of a melting glacier). You can see why Zinnemann wanted this episode in there, even if the strain to integrate it into the plot is too much for the movie. In fact, it’s not integrated in, Zinnemann doesn’t quite pull it off, and this little bit does not really seem all that mythically haunting or perversely eerie—but that’s sort of why I like it. Zinnemann’s trying for the mythic, and just not quite making, is somehow touching. After this point, it is much easier to be sympathetic to the film; besides that, in the picture’s second half there are fewer murky intimations among the people and more sensational mountain climbing. The climbing sequences are spectacular. The last part of the small human drama is played out on the sides of the mountains, and the action is quite breathtaking. The assault on a sheer face of solid ice, carving toeholds on the way up, is astounding. It’s an apt visualization of the ultimate Zinnemann situation: ambiguities put aside, a problem is clearly seen, the solution executed with icy, dogged simplicity. Would that the movie were less muddled. But it’s on to the next mountain—if Fred Zinnemann thinks it’s worth the trip. When I was looking for something under “Z” in my file cabinet (Zemeckis-related, actually), I came across a Photostat of this review, which was cut from the Seattle Film Society’s monthly journal, The Informer. I never did get around to printing it, so here it is. The review may be nothing great but the movie is an interesting “old man’s film,” a late-in-life effort from a filmmaker who isn’t trying to impress anybody anymore. Freddy Z goes back to the Bergfilm era of German film, with its ecstatic renderings of nature and the big melodrama played out there. Except that Zinnemann doesn’t do big melodrama, he makes watches. The movie is pretty obscure now, and it is not a conventional success, but it does have a genuinely haunting element at play. I had more to say about the Z-man when I did a career piece for Film Comment in 1997, which I will reprint one of these days. You are currently browsing the archives for the 1982 category.